Choice Based Conjoint analysis is used in marketing to detect important product attributes from choices of product profiles. 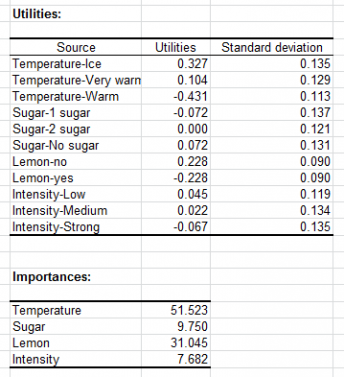 Run CBC in Excel with XLSTAT. Conjoint analysis is a comprehensive method for the analysis of new products in a competitive environment. This tool allows you to carry out the step of analyzing the results obtained after the collection of responses from a sample of people. It is the fourth step of the analysis, once the attributes have been defined, the design has been generated and the individual responses have been collected. 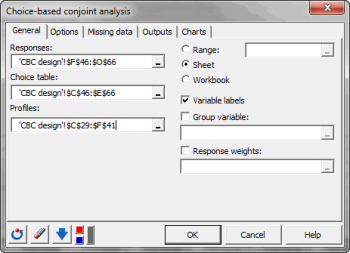 XLSTAT-Conjoint analysis software proposes to include a segmentation variable that will build separate models for each group defined by the variable. In addition to utilities, conjoint analysis provides the importance associated with each variable.